The “I Have A Dream” Foundation(IHDF) is a leading education nonprofit focused on breaking the cycle of intergenerational poverty through a comprehensive program of support that follows the same group of young people (“Dreamers”) from elementary school all the way through college. Founded in 1981 through the vision of Eugene Lang, IHDF operates in 16 cities and has served over 18,000 Dreamers. Learn more at http://www.ihaveadreamfoundation.org. 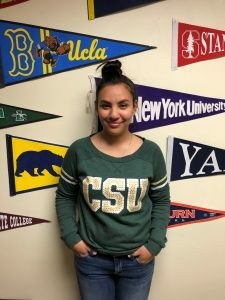 For College Signing Day, we asked 12th grade Dreamers about the support, successes, and challenges that brought them to this day, and the strategies they plan to use in their transition to college. Chasel is a Dreamer in the Records-Rainaldi Class of 2018 at the Colorado “I Have A Dream” Foundation and is a current senior at STRIVE Preparatory Schools – Excel Campus in northwest Denver. What made your participation in College Signing Day possible? I credit my participation in College Signing Day from the ability to go to Ms. Dusty (Colorado “I Have A Dream” Foundation Program Director) and Mr. Justin (Colorado “I Have A Dream” Assistant Program Director) if I ever needed them. They helped me revise the applications and essays I wrote for college admissions and for scholarship opportunities. With the Colorado “I Have A Dream” Foundation’s support, I felt that I was able to go to them with questions about the application and financial aid process which helped me be successful. The college readiness Saturday sessions held last fall addressed questions I had about future college experiences and how to get into college since I am a first generation college student. What college will you be attending and what is your intended major? I was accepted to Colorado State University (CSU) in Fort Collins, Colorado, where I plan to pursue an undergraduate degree in Animal Science. After graduating with my Bachelor’s Degree, I plan to apply to CSU’s School of Veterinary Medicine. I am committed to becoming a veterinarian so that I can increase the representation of Latinas in the veterinary field. In the future, I plan to mentor young Latinas interested in becoming veterinarians. What have been any major challenges they have overcome or achievements they would like to highlight on their college journey? During the summer after her ninth grade year, Chasel successfully completed an internship with University Hills Animal Hospital in Denver, where her responsibilities included administering medications to cats and dogs, sterilizing and packaging medical instruments and surgery utensils, and caring for animals post-surgery. The summers after Chasel’s tenth and eleventh grade years, she interned at Denver Animal Shelter, where she prepared vaccines for veterinary technicians, measured pets’ vital signs, and learned about animal control issues, including abuse and neglect. Chasel was invited to return to Denver Animal Shelter again as an intern this summer after she graduates from high school in May. fine-tuned their career goals, and participated in service-learning and civic engagement activities. Chasel is a natural leader who will thrive in a university environment where she will have opportunities to learn both within and beyond a classroom setting. Furthermore, Chasel was selected from a group of dozens of her peers to receive the 2017 Summit Award, which recognizes a student in our program who has demonstrated leadership in their community while overcoming significant personal obstacles. What are you excited about for college? I am very excited for college and the opportunity to experience life away from home. I look forward to being able to do things on my own and so that I can become more independent. I am excited to network and meet new people. I am especially excited to learn more about the Animal Science field of study at Colorado State University. What concerns do you have related to college? What strategies do they have to overcome them? One concern I have is the ability to handle being away from home and staying focused on my work in school. I intend to overcome this challenge by continuing the habits I started in high school with balancing school, my participation in extracurricular activities, work, and social life. I also plan to ask my friends and professors for help when I find myself not understanding certain aspects of the class material. What advice would you share with a younger Dreamer about getting to where you are now?